As discussed here several times, proponents of microbes-to-metallurgist evolution have a mighty dim view of our ancestors. Evolutionists see them as brutish creatures that had been more like ape than man, with intelligence yet to evolve. Of course, this is all based on evolutionary presuppositions and assumptions, not on evidence. (I wonder how many further assumptions were made in formulating the so-called "Paleo Diet"?) But when evolutionist try to slap leather with biblical creationists, they shoot themselves in the foot — nothing more humiliating than being shot with your own gun, but figuratively, that happens to them all the time. I'm saying that even according to evolutionary "evidence", archaic humans such as Neanderthals showed remarkable intelligence and culture. This is a mite disconcerting to Darwinists, to say the least. It's been said that archaeologists use the Bible as a source book so they can get an idea where to start digging. Although I can't verify that, I wouldn't be surprised if it's true, since archaeologists keep confirming the Bible, and do not refute it. (Watch out for the foolish argument from silence that basically goes, "Archaeologists haven't found a certain thing, therefore, it didn't happen".) Joshua's defeat of Hazor, Tel Rechesh site near Mount Tabor, the riot in Ephesus described in Acts, the exodus of the Israelites from Egypt — the list is actually much larger that this here sampling. As an aside, did you know that there are no atheists described in the Bible? They proclaim themselves as intellectually elite because they are "freethinkers", unshackled from "religion", but people in Genesis knew full well that God exists. Later, false gods appeared so people could avoid the true God. Psalm 14:1 says that someone who says, "There is no God" is a fool, but look closely: it's someone who says it in his heart. While it fits the relatively modern phenomenon of atheism, it also describes people who live as if God is irrelevant. Bible-believing Christians take Genesis as actual history. Why? Because it's written as history, not as poetry or allegory. (I'll allow that there are some poetical sections that state history, such as in Genesis 4:23-24, but for the most part, it's written as a straightforward historical narrative.) Henry M. Morris III was talking about ancient humans in a podcast. He pointed out that the Bible talks about people who are skilled at making musical instruments, working with metals, and keeping livestock (Genesis 4:20-22). Conversations were sophisticated, not a series of grunts, such as evolutionists would have us believe; they didn't spend thousands of years trying to evolve language. 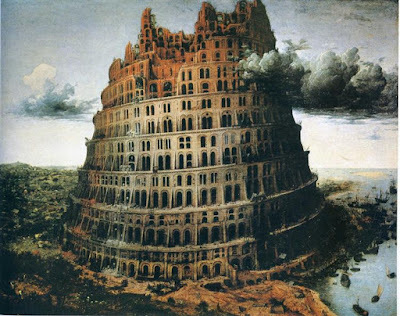 They built cities, spoke, wrote, recorded their own history (it's possible that Adam wrote the opening passages of the Bible in a book, which was later taken onto Noah's Ark), and so on. You see, Adam and Eve were created very good, not brutes that were limited in their abilities to think. Their descendants were intelligent. It should not be so difficult to understand that Noah built the Ark, or that Nimrod built the Tower of Babel (imagined in the picture above). Abraham's hometown, Ur of the Chaldees, had an extensive library. Evolutionary thinking has caused historians and some archaeologists to be baffled by the skill and intelligence of the ancients, such as the construction of Stonehenge and of the Egyptian pyramids, out-of-place artifacts, and so on. Instead of admitting that evolution, long ages, and materialism are dead ends, they cling to their false beliefs, even invoking "ancient aliens". The facts remain that God is the Creator, he made us recently, he became man and died on a cross for our sins but bodily rose on the third day, and he makes the rules.